When you go to a hockey game with tickets purchased by a commercial real estate bigwig, you sit in really ridiculously good seats. 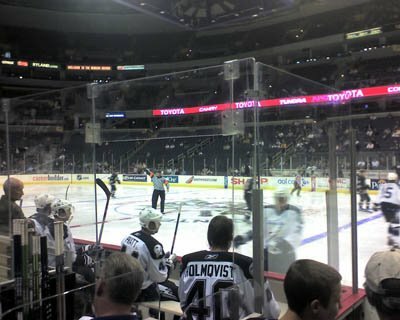 I've only been to one other hockey game in my life and was mystified at more than a few points. Paramount among them: when something called "The Hockey Song" came on and people in the arena enthusiastically chimed in like it was the national anthem. Anyhoo, before the game, my friend and I met at California Tortilla and she informed me that if you make an animal noise you score free chips and queso there. I stepped to the counter and asked if I really had to make the noise to get the free grub. "Uh huh," the girl wearing an oversized foam zebra hat said, in a tone that indicated the weight of the world fell somewhere between the zebra's netherregions and her shoulders. So, daintily, I oinked. "It's gotta be a jungle animal," she sighed. Drawing a blank, I glanced at my friend. "How about a monkey?" she offered helpfully. I turned back to the register and gave an admittedly less-inspired "Ooh, ooh, ooh." Still scowling, she turned and bellowed "chips and queso," to the guy behind her. Later, at the table, my friend pondered why the girl made me even make the actual animal noise after I'd mentioned the offer. "Because she's working at California Tortilla for about $4.50 an hour, wearing a foam zebra hat," I said, "and if nothing else, she's making the chick on the other side of the counter make the goddamn animal noise." Oh, and next time I'm totally doing a liger. She gets to wear a zebra hat while you have to make a jungle animal noise? Are those two things mutually exclusive? I mean, zebras are plains animals, not jungle animals. I'm still trying to figure out the jungle animal/Americanized Mexican food connection. I agree with I-66, and I want to be there when he points this out to her. Off to the side, of course, so as to be out of the path of flying queso. But it would make for quite a show. I think they're trying to tell you what's in your burrito.